The Audacity of Hope was alive and in living color back in 2009. And Done is Better Than Perfect was my living, breathing mantra. This was the literal and metaphoric fuel that powered me toward completion of my doctoral dissertation. I repeated it daily. Done is Better Than Perfect. 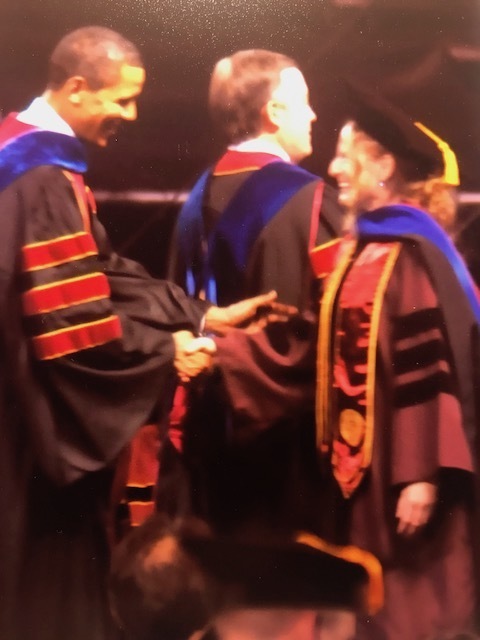 During the two year period that I researched, wrote and defended my dissertation, I became the so(u)le mama of two young children, moved through financial, health and personal challenges and completed my degree as the first Doctoral graduate of the program—just in time to meet then President Barack Hussein Obama. The catalytic fuel of my work, then and now, is still, Done is Better Than Perfect. As we are on the precipice of a new year, the entrepreneurial push to create those things not yet created (programs, courses, websites, webinars, workshops, etc.) is palpable. And often with this push to create, comes the pull of perfection. The pull of perfection whispers gushing rivers of “not-good-enoughs,” highlighting any vast array of insecurities that stop the creative process. The inner perfectionist pulls on our “not-enoughs” to breed self doubt and squash our belief and faith in our own creative capacities and ability to persist. So if you are in creation phase with your work, go all in. You can edit and revise later. You can’t optimize something you have not yet created. You can’t up-level something only your mind’s eye can see. You cannot beta test what you can’t share. So, if you have actually done the work and created something, and it is not perfect, celebrate it. Because tomorrow, you get to review, revise and evolve that thing. The fact that you have something to be optimized means your belief and commitment to seeing your vision through to its imperfect state won out. Choose belief and persistence in your creative capacities.